The Wichita Falls Police Department’s Financial Crimes Unit would like to remind people to be cautious when purchasing tickets to special events and recreational parks online. The old adage, ‘If it seems too good to be true, it probably is,” is always a good reminder. When purchasing tickets online from a third party and not an official vendor it is a case of “Buyer beware.” The tickets may be fraudulent and you run the risk of the tickets not being accepted by the venue you are trying to enter. If you do decide to purchase a ticket from a third party remember that a physical ticket is always better than a digital one. Fraudulent digital tickets and codes can be easily reproduced. Be careful in how you make any purchase from an unauthorized ticket seller. Never give the seller access to your personal financial account information. And, if you meet in person do so in a public place and bring a friend with you. On 03-15-17, just after 6pm, WFPD Officers were dispatched to the Sonic on Loop 11 in reference to a forgery. Upon arrival, employees advised that the customer in stall 6 had paid for his order with a counterfeit $50 bill. Officers made contact with the suspect who was identified as 18 year old Dakota Torrence. Investigation revealed that Torrence had, in fact, passed a counterfeit $50 bill and had another one sitting on the dashboard in front of him. Torrence was arrested for Forgery and transported to jail. 1. Use the letter slots inside your Post Office for your mail, or hand it to a letter carrier. 2. Pick up your mail promptly after delivery. Don’t leave it in your mailbox overnight. If you’re expecting checks, credit cards, or other negotiable items, ask a trusted friend or neighbor to pick up your mail. 3. If you don’t receive a check or other valuable mail you’re expecting, contact the issuing agency immediately. 4. If you change your address, immediately notify your Post Office and anyone with whom you do business via the mail. 5. Don’t send cash in the mail. 6. Tell your Post Office when you’ll be out of town, so they can hold your mail until you return. 7. 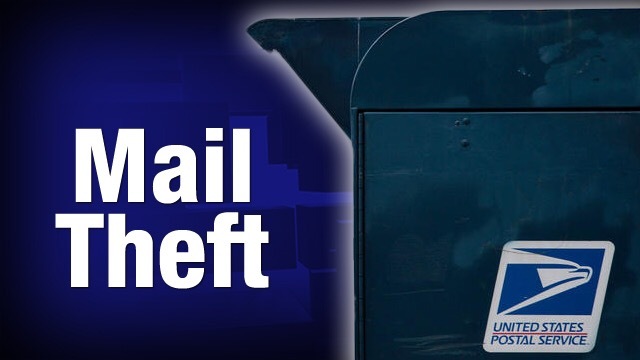 Report all suspected mail theft to a Postal Inspector. 8. Consider starting a neighborhood watch program. By exchanging work and vacation schedules with trusted friends and neighbors, you can watch each other’s mailboxes (as well as homes). 9. Consult with your local Postmaster for the most up-to-date regulations on mailboxes, including the availability of locked centralized or curbside mailboxes. On Thursday, February 9th, at approximately 3:45 pm officers with the Wichita Falls Police Department were dispatched to the 2700 block of Southwest Parkway to the Wells Fargo bank in reference to a possible forgery in progress. Upon arrival officers spoke with a bank employee who stated that a subject, later identified as 20 year old Yaw Ferkah-Ahenkorah of Chickasha, OK, came into the bank and attempted to deposit three fraudulent checks totaling $283,000.00. Officers detained Ferkah-Ahenkorah. Ferkah-Ahenkorah advised police that college friends from the University of Science and Arts gave him the checks to deposit. He stated that he came to the bike trails in Wichita Falls when a friend told him to go deposit the checks at Wells Fargo. After further investigating it was determined that Ferkah-Ahenkorah had earlier attempted to deposit two other fraudulent checks totaling $440,000.00 at the Wells Fargo bank located on Kell East. Ferkah-Ahenkorah was arrested and transported to the Wichita County jail without incident where he was charged with Forgery. It’s that time of year again and tax time is fast approaching, with that it mind the scammers will be out in full force attempting to steal your money and identity. Scammers will try to convince you to pay them money for owed taxes or requesting payment (money up front) for a tax return. They may even ask for personal information to “verify” your identity so they can complete their offer to help. Like before. scammers are going to use threats such as warrants, and the police are coming to get you, or watching your house. These are all false and should be reported to the police and IRS as soon as possible. Detective Jason Jones has been selected as the Wichita Falls City’s Employee of the Month for January 2017. Jason was recognized at the first City Council meeting of the year. Detective Jones worked for the Burkburnett Police Department, Electra Police Department, and the Iowa Park Police Department before signing on with the Wichita Falls Police Department in 2000. During the past 16 years he has served in Patrol and in various units within the Criminal Investigation Section. He is currently assigned to the Financial Crimes Unit. Detective Jones has been trained by the Secret Service as a Digital Forensics Investigator. He is certified on numerous digital forensic platforms such as Cellebrite, Pareben, and the F.R.E.D system. His service in the forensics field not only serves the WFPD but also surrounding agencies. Detective Jones goes above and beyond the typical duties of an investigator to provide the utmost opportunity for criminal prosecution in cases which involve digital forensics. Detective Jones’ dedication and work ethic brings great credit to the Wichita Falls Police Department and the City of Wichita Falls. Great Job! !